Stop what you’re doing and take a deep breath. Imagine you’re in your office, thinking about that vacation you went on a couple of years ago. Remember that awesome photo you took, when everything was just right? Think about the lighting, the people, the memories tied to it. Now, think about trying to find that photo on your hard drive - but it’s gone. It’s that time of year again - time to backup your data! March 31st is World Backup Day. Backups shouldn’t be only an annual thing, but you have to start somewhere and build these habits monthly, weekly, or daily. You can read more about World Backup Day here. Whether it’s on your hard drive or in the cloud, you should have a copy of your files somewhere safe. Accounting for multiple copies of your data in a few separate places will ensure that you never lose your data in an accident or extraneous circumstance. When it comes to backing up your data, redundancy can be key - bad things often come in twos. Our app is very simple for cloud to cloud backups, but getting your local files to the cloud is understandably a little intimidating - so we made a guide! Of course, the most direct way for you to get your files elsewhere from your local computer would be using an FTP, SFTP, or WebDAV server in conjunction with Mover - but for this blog post, we’ll take you through creating a redundant backup using very simple technologies, including a cloud service of your choice and our very own Mover Vault. Choosing a cloud service is all about weighing the benefits against one another. There are tons of helpful reviews online if you’re stumped for choices, but they all do about the same when it comes to reliability and ease of use. Thankfully, Mover connects to over twenty different cloud services! The following information was only up to date as of March 31, 2016. For up to date information on each service, visit their respective website. *Expandable based on completion of specific criteria. What the sync client does is keep local and cloud folders in harmony - everything you put into the local directory will be uploaded to the cloud, and vice versa. If you delete a file or folder from either locations, it will be deleted in the other. A quick web search will get you the sync client for the respective service you have signed up for, such as “Dropbox sync client” or “OneDrive sync client”. 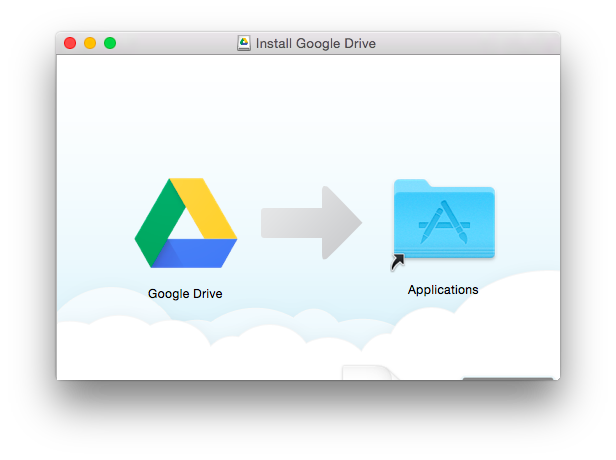 Once it’s downloaded, you’ll want to open the installer file and follow the short installation steps. You’ll now have a small Google Drive icon in your system tray/taskbar at the top of the screen (Mac) or the bottom right (PC) and a dedicated Google Drive folder on your computer. Move all the stuff you’d like to backup to that folder. If you’ve got a lot of data on your computer that you’d like to sync, it could take a while for the sync client to upload everything. Once everything is synced, you’re ready for the next step. First, add your Google Drive account to our app. All it takes is a few clicks. We offer over twenty different destinations - but for this example, we’ll choose Mover Vault. It’s your very own personal, unlimited storage bucket in the cloud. It’s even easier to authorize. After that, simply select Backup, specify what options you’d like to use, and hit ‘Save Backup’. Done! You now have files in three places: your computer, Google Drive (or the cloud service of your choice), and safely in the Mover Vault. If your computer crashes, you’ll have copies of your data in two other places. Find out more about the Mover Vault here. Thanks for reading - don’t forget to check us out on our Twitter, LinkedIn, and Facebook pages! March 1, 2018 - Updated to fix broken links.